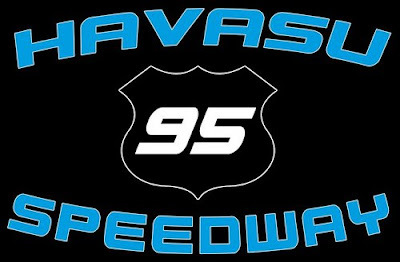 Bill Rozhon, Promoter of the Havasu 95 Speedway has been smiling a lot these days. After months of overseeing his 2015 -2016 winter racing season he has arrived at one of his favorite nights of the year. This very fun race track, located in beautiful Lake Havasu City-Arizona, will be officially concluding its 2015 - 2016 winter racing season this Saturday night with a time honored tradition Rozhon created many years ago: the season ending Night of Destruction. The evening includes the speedway's exciting, and sometimes even hilarious, waterless boat race. The object here is to complete the race with a boat attached to your race car. Trailers for the boats are not allowed. The drivers will literally drag the boats on the speedway surface. If by chance a boat is knocked loose from a car, the driver has the option of collecting a wrecked boat lying on the track and push it with their front bumper. Whether the boat is towed or pushed, the object is maintain contact with a boat. Adding to the fun will be the presence of the Felon, a monster truck whose intent is to tear up the speedway's infield and destroy any parked car that dares park before it. The evening will conclude with Rozhon's famous fireworks show. A huge thank you goes out to Interstate Batteries and Get It Gear Transmissions for sponsoring this very special annual event. The spectator gates will open at 5pm with the Night Of Destruction seeing a green flag at 7pm. General admission tickets, age 17 plus, are $12. Tickets for seniors, military personnel and the handicapped are $10. Kids tickets, age 6 to 16, are $6. Lake Havasu Unified School District students can receive a one dollar discount by presenting their school ID at the ticket gate. Kids 5 and under will be admitted free. The speedway also offers a budget friendly family pack for $25 which admits two adults and two kids. Fans can also enjoy the special amenities of the speedway's VIP section for $25. Advance tickets, highly recommended for this annual event, can be purchases at Peggy's Sunrise Café located at 1584 Country Shire Avenue. For out of town race teams and fans the Quality Inn and Suites is the official motel of the Havasu 95 Speedway. Located at 271 Lake Havasu Avenue, they offer beautiful and spacious rooms at affordable rates. Call 928 855 1111 for reservations which can also be made online. For more information regarding Night Of Destruction dial up the speedway's official website at www.havasu95speedway.com or visit their Facebook page. With an abundance of race tracks presenting ever form of motorsports than you could name, spread out in a complex that measures 600 plus acres, there's always going to be plenty of action at the Willow Springs International Raceway, located in the beautiful community of Rosamond-California. They're going to prove that point this weekend by treating their fans to another full weekend led by stock car racing at the Speedway Willow Spring, the facility's quarter mile paved oval, who will present six different racing divisions, this Saturday-April 16th, during the course of a special day race that will receive the green flag at 1pm. Those racing division on the schedule include: the Elite Division, Street Stocks, Hobby Stocks, Mini Stocks, Skid Plates and the So Cal Enduro Racers. The Hooper's Rear End Service Elite Division is a unique racing group, created by the Speedway Willow Springs management team, that allows Super Late Model, Late Model, Modifieds, Southwest Tour and Spec Trucks to race together all under the guide lines of a single rule book. During the waning laps of the division's March 26th season opening main event, Alex Anderson staged a razor sharp maneuver that moved him from third place to victory lane. However, it was runner up David Brandon who left Rosamond as the division's point leader. That''s because of a rather elaborate points system created by the management. In addition to main event championship points, bonus points are awarded based on qualifying, heat races and even passing. Brandon had a great night during those preliminary events and that's how he became the first points leader on opening day. However there's only a two point separation between these two drivers going into next Saturday's race and you can expect Anderson to address that issue. The Platinum Jewelry and Loan Street Stocks were a major highlight of opening day when 71 year old Bruce Secord fended off a hard charging, and much younger, Tony Forfa IV. As the pair sailed under the checkers, the margin of victory was approximately half the length of Secord's left front fender. The other result was a crowd of excited race fans on their feet enjoying the action. Secord will go into next Saturday's race with a two point advantage over Forfa and we will all be watching them to see if they create another intense performance similar to what we observed on opening day. 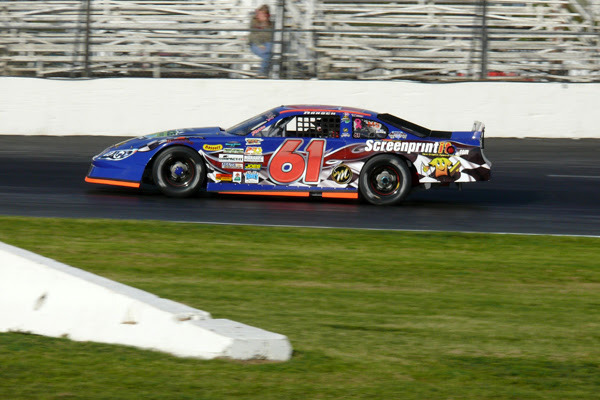 Based on the strength of his main event win last month, Johnny Troesch will start next Saturday's race with a three point advantage in the championship standings over Brandon Fisk in the Wayne and Dave's Automotive Hobby Stock division. Here's yet another group of racers doing a fine job of putting on a great show. In the Lucas Oil Products Mini Stock division John Dunlap scored his long awaited first ever win at Speedway Willow Springs on opening day and now will be focused on collecting his second, consecutive, win this Saturday. Dunlap also did extremely well in collecting bonus points during the preliminary events and will go into next Saturday with an eight point lead in the championship standings. Skid Plate racing is a fun concept that has quickly captured the attention of fans at tracks all across the country. The division is comprised of sport compact cars with a low budget build factor. The rear tires are removed and replaced with a pair of hubs with steel plates attached to them. The result is a race car showering sparks off the rear wheels while the drivers to their best to control the direction of the sliding cars. It's a lot of fun to watch. Brady Mertz was the first 2016 winner during last month's season opener. He will be going into next Saturday afternoon's second race of the season with a 13 point advantage in the championship standings over drivers John Carter and Angel Carter who are tied for second. Last, but never least, will be the presence of the So Cal Enduro Racers. These are your basic low budget Mini Stocks but their literally fly around the Speedway Willow Springs quarter mile while sometimes racing under altered track conditions such as entering a straightaway through the infield while negotiating their way around large tractor tires. At the conclusion of opening day, Nate Van DeVenter was the first 2016 series winner with Pete Chilbes and Michael Walters second in third in both the race and the points standings. Saturday's main event is being sponsored by Motion Tire and Wheel of Ridgecrest and DRC Pump System. Their main event has been dubbed the Motion Tire 100. That's right, these enduro drivers are going to run 100 very fast paced laps, while competing for a $400 winner's check, in what is highly anticipated as being one of the major highlights of next Saturday's race schedule. General admission tickets are $10 with kids ten and under admitted free. 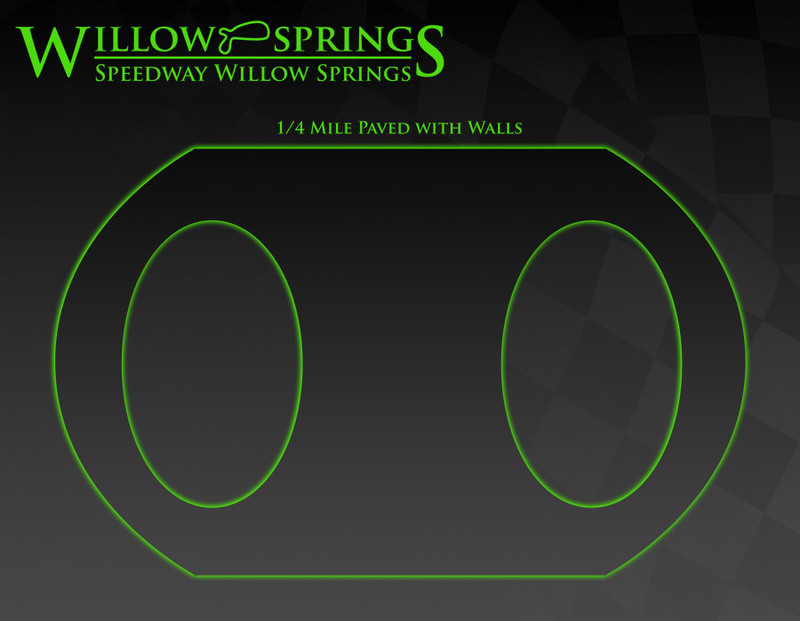 The purchase of a $10 wrist band, at the front gate of the complex, will allow fans to watch all racing activities at all of the Willow Springs Tracks on both Saturday and Sunday. A case in point regarding this particular weekend is the presence of Extreme Speed's Auto Track Days who will be racing high powered sports cars,on both Saturday and Sunday, on "Big Willow", the facility's premiere 2.5 mile nine turn road course.The cars will be on the track all day from 8am to 5pm. Also on Saturday and Sunday will be hot motorcycle action presented by the California Superbike School. While the intent here is motorcycle racing lessons, the track will be filled all day with high powered bikes that will be a sight to see on the "Streets Of Willow Springs" the facility's other challenging road course measuring 1.6 miles of twisting right and left hand turns. In the case of the action at both road courses, fans are allowed to visit the pit areas to meet the drivers and get an up close and personal look at their racing machines. That's a lot of action for a $10 weekend. It's exactly the reason why Willow Springs International Raceway is regarded as being one of the most fan friendly racing facilities in the country and why it's been in top flight operation since 1953. It's also the reason why it's going to be another busy, but fun, weekend at Willow Springs. Make sure you visit the Speedway Willow Springs and its hot stock car show on the quarter mile paved oval this Saturday afternoon at 1pm. It's has all the makings of being the hottest racing show in the So Cal area. SACRAMENTO, CALIFORNIA (April 11, 2016) - A large field of drivers will battle for the win at one of the Pacific Challenge Series' home tracks, when the Super Late Models hit All American Speedway in Roseville, CA on Saturday night. The PenneyLawyers.com presented action will feature a 75 lap feature on the one-third mile asphalt oval located on the Placer County Fairgrounds. It is the second race of the 2016 Pacific Challenge Series schedule after Jacob Gomes won the series opener at Madera Speedway in March. Saturday's race is the first of three points races and four events total for PCS at All American Speedway, and is also located just a few miles east of the Pacific Challenge Series offices that are inside Penney Racing Supply. For many drivers in Saturday's field, the race serves as a home race. "If you haven't been there you need to come out because it is a special place. Beautiful spot to spectate!" Moore said. "I had a hand in restoring it with my friend (Bill) McAnally a few years ago and we put a lot of heart in it. It is a special place to both of us." Roseville's Shannon Mansch won this event one year ago and is looking to bounce back from a hard crash at Madera three weeks ago. Mansch's win last year was her first top-five in five attempts at her home speedway so she looks to use that momentum for another strong finish this year. 2014 PCS champion Mike Beeler of Modesto has one series win at Roseville in seven starts. Travis Milburn of Eagle, ID got his first Roseville PCS win in June last year while Modesto's Kyle Gottula won the September round last season. Loomis' Chris Scribner has six attempts at Roseville while JR Courage has four and each is still looking for their first W.
A host of drivers are aiming at their first attempts of the 2016 season on Saturday night, including 2009 track champion Jason Romero of Cameron Park, Stockton 99 Speedway Super Stock champion Matthew Wendt, 2010 Roseville track Rookie of the Year Michelle Nagai, 2015 fifth in points Don Swartz, and Redding's Jason Mitchell. The top-ten in the Pacific Challenge Series standings following Madera sees Jacob Gomes ahead of Jeremy Doss, Jeff Bischofberger, John Moore, Canada's Darrell Midgley, Chris Scribner, JR Courage, Hayward's Danny Malfatti, Upperlake's Jimmy Stillman, and Cole Moore. Valley Springs' Tracy Bolin broke the Madera track record before failing to finish and credited with 16th place. Elk Grove's Mike Hite was sixth in the 2015 order but dropped out early at Madera as well to finish 18th. A great night of racing will be presented to the fans with the Legends of the Pacific and Street Stocks joining the card along with the American Racer Tires dash. Friday action includes a practice session from 3 p.m. until dark. The pit gates will open at 1 p.m. for practice with pricing $40 per person (no car fees). On Saturday grandstands open at 4 p.m. with racing at 6 p.m. Pit passes are $30 for PCS members and $40 for non-members. The Pacific Challenge Series is presented by: Penney Racing Supply, Penney & Associates, American Racer Tires, Maita Chevrolet, Compact-It, Northwest Compactors, Naake Suspension, Sunoco Fuels, Five Star Bodies, Lefthander Chassis, ARP Bodies, Joes Racing Products, Bassett Wheels, Frank's Radio, WrapStar Pro, and Blakesley Sports Media. All PCS Super Late Models race ABC Bodies or Muscle Car bodies on American Racer Tires with Sunoco Racing Fuel. If you believe that asphalt is for racing and dirt belongs under the asphalt, then here's a collection of hot racing tickets from California and Arizona for you to consider heading into next weekend. Saturday, April 16th. All American will be treating its fans to a full evening highlighted by the presence of the Pacific Challenge Series Late Models, presented by Penny Lawyers (dot) Com, which is highly regarded as being one of the better late model regional touring series in the western states. Adding to the racing excitement will be the presence of the Street Stock division and the Legends of the Pacific. The spectator gates will open at 4pm with the racing going green at 6pm. Adult tickets, age 16 to 59, are $15. Tickets for seniors, age 60 plus, and juniors, age 6 to 15, are $7 with children age 6 and under admitted free. The speedway also offers a budget friendly family pass for $35 which admits 2 adults and 3 juniors. Saturday, April 16th. This very fun race track will be officially concluding its 2015 - 2016 winter racing season this Saturday night with a time honored tradition they created many years ago: the season ending Night of Destruction. The evening includes the speedway's exciting, and sometimes even hilarious, waterless boat race. The object here is to complete the race with a boat attached to your race car. Trailers for the boats are not allowed. The drivers will literally drag the boats on the speedway surface. If by chance a boat is knocked loose from a car, the driver has the option of collecting a wrecked boat lying on the track and push it with their front bumper. Whether the boat is towed or pushed, the object is maintain contact with a boat. The speedway will also treat its fans to some stock car racing while wrapping up two points championships. Points champions will be officially crowned Saturday night in the speedway's Bandolero and Sam Nichols Electric Factory Stocks. Adding to the fun will be a monster truck show. The spectator gates will open at 5pm with the Night Of Destruction seeing a green flag at 7pm. General admission tickets, age 17 plus, are $12. Tickets for seniors, military personnel and the handicapped are $10. Kids tickets, age 6 to 16, are $6. Lake Havasu Unified School District students can receive a one dollar discount by presenting their school ID at the ticket gate. Kids 5 and under will be admitted free. The speedway also offers a budget friendly family pack for $25 which admits two adults and two kids. Fans can also enjoy the special amenities of the speedway's VIP section for $25. Saturday, April 16th. It's going to be another busy, not to mention exciting, night at the IEC. The NASCAR Whelen All American Series will be providing the action featuring the Seidner's Collision Centers Irwindale Race Trucks, the Pick Your Part Late Models, the Race Car Factory Spec Late Models, Legends, Mini Stocks, Super Stocks and the Bandoleros. The spectator gates will open at 4pm with the green flag falling on this fully loaded racing evening at 7pm. Adult tickets are $10 if purchased in advance via online or in person at the speedway box office located at 500 Speedway Drive in Irwindale. Otherwise, adult tickets purchased at the gate on race day Saturday will be $15. Children's tickets are $5. Saturday, April 16th. NASCAR's home to Kern County will be presenting the NASCAR Whelen All American Series Saturday with the on track action being provided by the NASCAR Late Models, NASCAR Spec Mods, INEX Bandoleros, NASCAR Mini Stocks and the Mini Dwarfs. Adding to the fun will be a special exhibition event from the slide ways, tire smoking, cars from Just Drift. The spectator gates will open at 5pm with the racing going green at 7pm. General admission tickets, age 16 plus, are $10. Tickets for active duty military, seniors 65 plus and kids age 6 to 15 are $7 while kids five and under will be admitted free. Saturday, April 16th. Lakeport will be kicking off 2016 with their season opener Saturday night featuring their Lakeport Challenge Series. The on track racing contenders will be comprised of the Bandolero, Bomber, Hard Top, Jammer, Legend and Pro 4 divisions. The spectator gates will open at 330pm. Qualifying runs will start at 5pm with heat races and main events to follow. General admission tickets are $12 while tickets for seniors, age 60 plus, and students with valid school ID are $9. A special ticket rate for first responders, with valid ID, is $6. Kids tickets, age 5 to 11, are $6 with toddlers and infants admitted free. The speedway also offers a budget friendly family pack for $30 which admits two adults and three kids. Saturday, April 16th. The fastest one third mile in the west has always been regarded as a hot ticket and will prove that point Saturday night with another fully packed show presented by the Hampton Inn and Suites. The on track action will be led by race #1 of the Enduro Extreme Series Barrel race which includes a 40 lap main event. Also on the excitement agenda will be the Madera Late Models, the Madera Hobby Stocks, the MSTs, Toyota Sedans, the 4 Bangers and a 25 lap exhibition race from the newly established Junior Late Model division. On race day qualifying will be held at 4pm followed by heat races at 545pm with opening ceremonies and main events set for 7pm. General admission tickets are $15 and $13 for seniors and military personnel. Youth tickets, age 6 to 12, are $7 with kids five and under admitted free. Saturday, April 16th. This speedway had a stunning season opener last March 26th and more of the same can be expected when they drop the green flag on a full day of racing this Saturday. Providing the on track action will be the speedway's Elite division, a racing group created by speedway officials that allows Super Late Models, Late Models, Modifieds, Southwest Tour and Spec Trucks to race together under a single rule book. Also, look for racing excitement from the So Cal Enduro Series, Street Stocks, Hobby Stocks, Mini Stocks and the Skid Plates. This event is a day race with all of the fun receiving a green flag at 1pm. 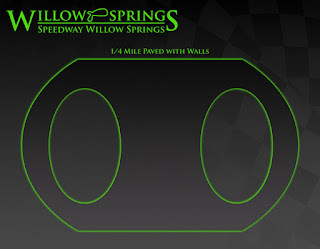 General admission is $10 which will buy fans a special wrist band that will allow them to visit all of the tracks, and their racing action, on both Saturday and Sunday and that why the Willow Springs International Raceway is regarded as being extremely fan friendly. Kids age 8 and under will be admitted free.